Online Invoices is a web service that simplifies the way business manage and monitor their sales, generate invoices, receive and track payments, and more. This invoicing solution is so robust you can also perform business accounting and calculate taxes and leverage comprehensive real-time reporting feature to precisely assess the progress of your business. With the Online Invoices’ basic and advanced features and capabilities, you can glance your business activities at any level, letting you see what’s going on and follow up at any stage. Online Invoices Suite is composed of three different modules that are created to handle specific workflows and areas of your business. Sales and Invoice Management System makes tracking sales, creating invoices, and getting payments a breeze. The Client Follow-Up and Management system delivers a platform that optimizes your client communication and lets you fully leverage transaction history to gain that distinct business advantage. The Invoice Management and Control module help you manage your inventory whether you’re at the office, at home, on the road, or even on a holiday. Online Invoices presents businesses with a robust, feature-rich invoicing and billing platform that integrates core capabilities from customer relationship management (CRM) and enterprise resource planning (ERP) systems, making it a comprehensive invoicing solution and more. Businesses can implement the software as an online invoicing tool or as an in-store billing application. Basically, Online Invoices speeds up your processes by automating invoice generation as well as processes for recurring bills. You can issue invoices and have them printed instantly or send them out to your customers directly with just a few clicks. Keeping track of customer and transaction history is critical for any business endeavor. Online Invoices makes it easy for you to store the entire history per invoice, such as the transaction date, transaction time, item, and whether the customer has read the email or not. You can create customer profiles with all their updated contact details, their whole history with your business, as well as notes and attachments. Online Invoices lets you track their actions to get you insights into customer patterns, behavior, tendencies, and more, giving you the edge you need to fully maximize and maintain long and fruitful relationships with your customers. Knowing what’s in your inventory helps you issue estimates and invoices to your clients along with product details, images, and barcodes. At the same time, you can send purchase orders to your suppliers for additional stocks to keep your inventory loaded. You can also add staff, set permissions, and access your inventory wherever you are, allowing you to manage your inventory without any hitch. It's crucial to keep in mind that virtually no service in the Accounting Software category is an ideal solution able to match all the requirements of all company types, sizes and industries. It may be a good idea to read a few Online Invoices reviews first as some solutions can perform well exclusively in a really narrow group of applications or be prepared with a very specific type of industry in mind. Others might work with an idea of being simple and intuitive and as a result lack advanced elements needed by more experienced users. You can also find services that support a large group of customers and provide a complex feature set, but this frequently comes at a more significant price of such a software. Ensure you're aware of your requirements so that you buy a service that has exactly the functionalities you look for. How Much Does Online Invoices Cost? 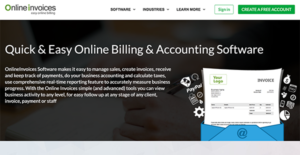 We realize that when you make a decision to buy Billing and Invoicing Software it’s important not only to see how experts evaluate it in their reviews, but also to find out if the real people and companies that buy it are actually satisfied with the product. That’s why we’ve created our behavior-based Customer Satisfaction Algorithm™ that gathers customer reviews, comments and Online Invoices reviews across a wide range of social media sites. The data is then presented in an easy to digest form showing how many people had positive and negative experience with Online Invoices. With that information at hand you should be equipped to make an informed buying decision that you won’t regret. What are Online Invoices pricing details? What integrations are available for Online Invoices? If you need more information about Online Invoices or you simply have a question let us know what you need and we’ll forward your request directly to the vendor.